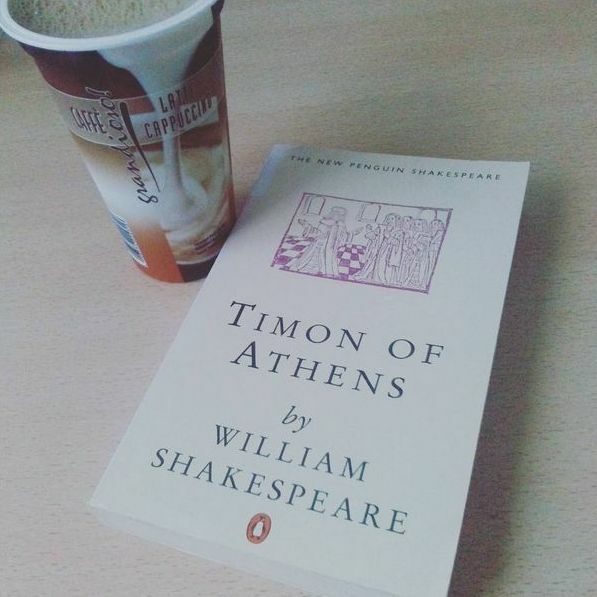 This blog is part reading diary, part collection of my reviews and part photo album of my book pics (stereotypically featuring hot beverages). My morning read. Like it a lot so far! Despite my scepticism towards children as narrators (especially in adult novels) I really, really enjoyed the book! The only thing that made me a bit sad was that at the end Pilar had to leave and Victor's mother hardly seemed to miss her. Of course it's nice that the father is finally "grown up" and the family is back together & stuff, but I was sooo happily to stumble upon a woman/woman relationship in a book which isn't specifically labeled a queer novel and it makes me sad that apparently these kind of relationships are only seen as an interlude before going back to "normal". 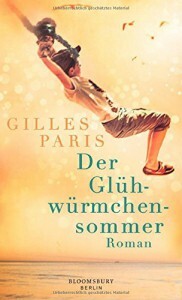 Other than that I did enjoy the book & the tenderness of the language. 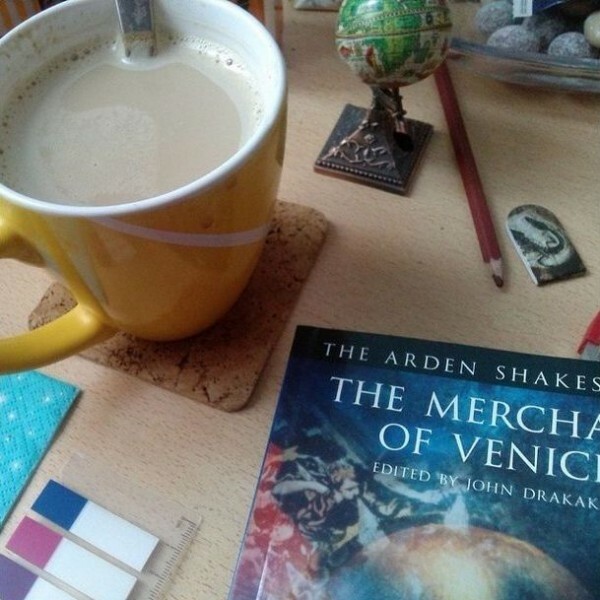 Showing off my Arden Shakespeare I: The Merchant of Venice feat. marzipan latte! 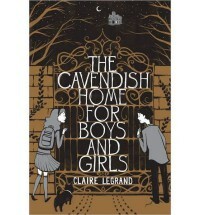 Just yesterday I finished "The Cavendish Home for Boys and Girls" & even though originally I planned to write a review I don't think I'll be able to do that. I honestly can't say anything regarding the quality of the book; I'm that overwhelmed how creepy and disgusting parts of it. At the beginning I really really enjoyed the. I liked the very likeable un-likeable-ness of Victoria & the gloomy athmosphere of Belleville & even though it was spooky indeed it was definitely a children's book. But when it came to the events inside the orphanage I was basically ... horrified? 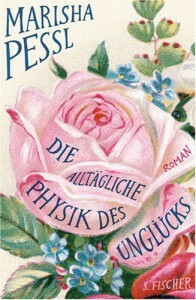 I mean, present!Rosa was not all too scared; I slept without nightmares and stuff, but whenever I read children's lit I cannot help asking myself if past!Rosa would have enjoyed it. In this case, I'm sure I'd have been totally scared and grossed out. Also, the trope about curing people from their passions by making them overdo then or simply making the act extremely unpleasurable is quite often used, but I found it especially disturbing in this book. I don't know if children read it differently - I quite often heard that children are less easily disgusted and creeped out than adults, so probably I'm actually too old for this book. (Well. I'm 22, which is super young, but anyway.) As I recall, I was also a very timid child that was easily frightened, so it maybe just isn't the book for me. That is to say, I'm also not a big fan of Roald Dahl of whom this book was reminiscent of. So, yeah, maybe me and Ms Cavendish's home just don't go together. I'm still glad that I read it, though, for the nicely-creepy vibe of the beginning and for holding it in my hand and looking at the beautiful cover! 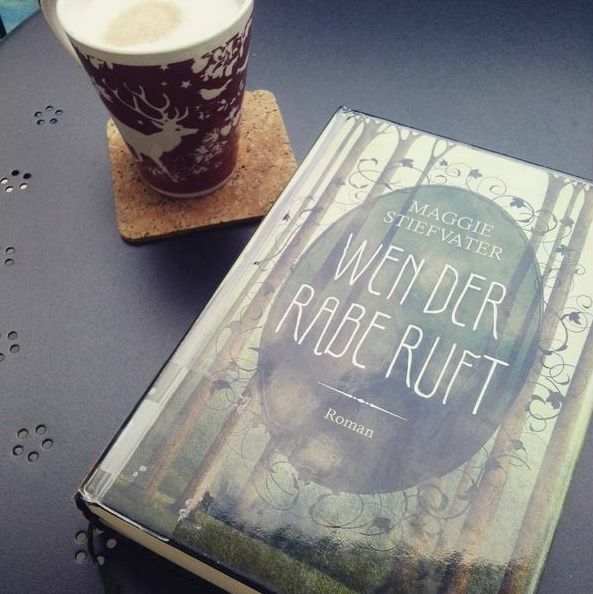 The wonderfully pretty German edition of "The Raven Boys" by Maggie Stiefvater. From the beginning until almost the end I was entertained but also annoyed. While I mostly liked the idea, the way of writing, the honourable mentions of approximately one quadrazillion works of literature - my dislike for Blue's father was so overwhelming, it almost ruined the book for me. Like, seriously. Whenever she brought up yet another one of his wise words and witticisms I was overcome with the strong desire to punch something. "What did you think? ", Goodreads asks me, so I'll tell you what I mostly thought while reading: "Nope, nope, nope." That's it, basically. Ok, it got a little better at the end and I almost granted it two stars (which would be quite good, considering my high amount of nope-ing), but then, it's just too...nope. One reason for my reaction could, of course, be, that I'm simply not that much into 13-year-old-girl-finds-true-love-novels anymore. I cannot deny that there still are some books of this kind I percieve as cute and enjoyable, but well, this one obviously not. A major reason may be my general dislike for snarky first person narrators in YA novels. Mostly, they are annoying at best and punch-in-the-face-able at worst, but this girl tops everything. I know, to describe her change into a better person she has to start kind of un-likeable, but this was just over the top. Kacey hosts a tv progam at her middle school (do things like this exist? I live in Germany, so I'm basically a person from medieval ages)in which she reads out anonymus letters from other pupils who seek help in some way. Her support mostly consists of harsh insults and apparently the whole high school idolizes her for being a huge a-hole. Her other hobbies include being mean to her friends (under pretence of simply wanting to tell the truth, like real journalists do), being incredibly superficial and lying to either get boys to like her or date her friends (where is your journalistic truth now, Kacey?). Firstly: I am aware of the fact that 12-year-olds are not the well-rounded, highly moral, modest and friendly human beings I would like them to be. Secondly: If today's 12-year-olds really are like the characters in this book, I do not want to live on this planet anymore. It was hard to believe that they are about 12/13 at all - at the beginning they seem more like the classic backstabbing, popular, I-describe-every-single-part-of-my-outfit-including-obscure-brand-names homecoming queens we all know (in my case only in fictional form), but then their age was mentioned and like the sensitive lady I am, I fainted. Yes, I know this does not make one happy; I had to endure both. But, breaking news: From the beginning on it is made clear that both of these terrifying instruments will only accompany her temporarily - she will need those freaking glasses for only four weeks or something like that, and still, this catastrophe destroys her whole life and hopes and future and what you will. I'm sorry. I do not take the situation in all its horrible immensity seriously. I simply can't. Believe me, I've tried, but all the time I was silently screaming at the pages: "PULL YOURSELF TOGETHER AND CUT THE DRAMA." 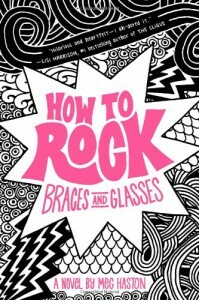 The bigger part of the book consists of the blahblah we all know: the freakish braces-and-glasses-monster has to live outside of civilized society and befriend nerd boys with skinny jeans. The horror! This life-changing experiences lead to her becoming a better person and finding the love of her life. Standard. But it is not so much the plot I criticize, really, but the characters. It's a comedy book, and therefore a certain degree of exagerration is excuseable, but really? Maybe this was just the final sign that I should stop reading young adult literature, which would be kind of sad, to be honest. 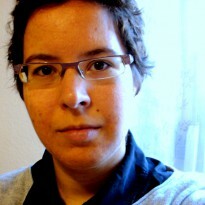 Anyway: How to Rock Braces and Glasses is nothing I would recommend to anyone ever. Stories like this can be found in countless other books, and in most of them the main character is not that utterly dislikeable. The hints that her behaviour could be a result of her father leaving the family could have been a good idea, but seemed half-hearted and unconvincing to me. That's really a pity, I was hoping that at one point the book would be able to evoke a bit of empathy inside me. I'm sorry. This review might be quite rude, and this even is the polite version. In my head it contained certainly more swear words. I am happy for people who really enjoyed the book, but, to be honest, I do not understand.